"The Chinese Linking Rings have passed through more hands and gathered more dust than any other effect in the history of magic. They have been twisted, hollowed out, bent, stretched, miniaturized, ostracized and reduced from sixteen rings down to two. The key ring itself has undergone remarkable changes-we now have the locking ring. As an alternative let us take the normal key, rework the handling and return the rings to their rightful place as a classic in magic. 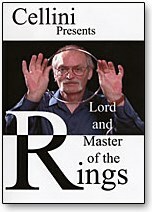 This video is not concerned with a specific routine, but rather a unique set of ideas, challenging the onlooker's imagination to create a performance by which he may someday acquire the title Lord and Master of the Rings."